Graham Anderson and his business partner, Greg Adams, have started a revolution. They met when they were both working for a multinational wood panelling company but identified a niche and a way to do things a little bit better. So now, they’ve struck out on their own, supplying quality wood-based panel products to cabinet makers, shopfitters and targeted sections of the industry. “We disagreed with the way that company marketed their product,” Graham said. “The business plan to create Revolution Wood Panels was born out of that frustration. 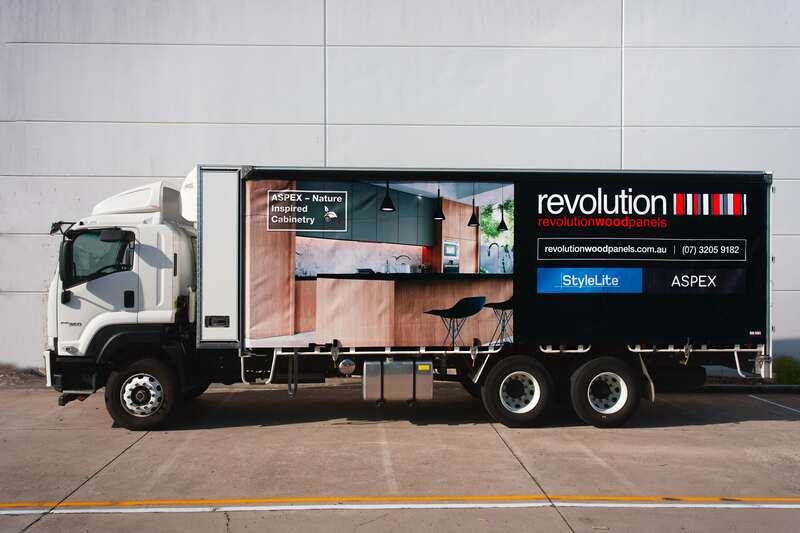 Revolution operates a 2,000 square metre distribution warehouse and an 800 square metre cut-to-size facility, both in the suburb Brendale in Brisbane. From here, the company expanded to Brisbane, Gold Coast and Sunshine Coast areas, with some larger project work leading into far north Queensland and interstate. To stay competitive against the multinationals, with fewer resources, Revolution had to focus on the areas where they could outstrip, without outspending. “When we’re going up against that market, it’s really important that we have a clear point of difference, and at that scale, it’s not so much about price,” he said. “It’s easy to see how we stand out…we consider ourselves the industry benchmark in service, quality and expertise. This attention to detail and quality of service extend across the business and are front of mind with every purchase Revolution makes. When it came time to pick a new truck to haul their panelling from project to project, Graham and Greg went on a reconnaissance mission. “The key factor it came down to was reputation,” Graham said. “Obviously we get to talk to a lot of people who know about trucks; not just trucking companies, but the drivers who actually drop products off. That truck – an FXD 1000 Long Wheel Base model – was picked up about three years ago. Having put the vehicle to work over that period, Revolution approached its next truck purchase armed with a new depth of information. “What we’ve found since then, and the reason we’ve gone with Isuzu each time, is basically performance,” Graham said. “The power and fuel efficiency are great, servicing intervals are significantly better, and the higher resale value is a consideration too. 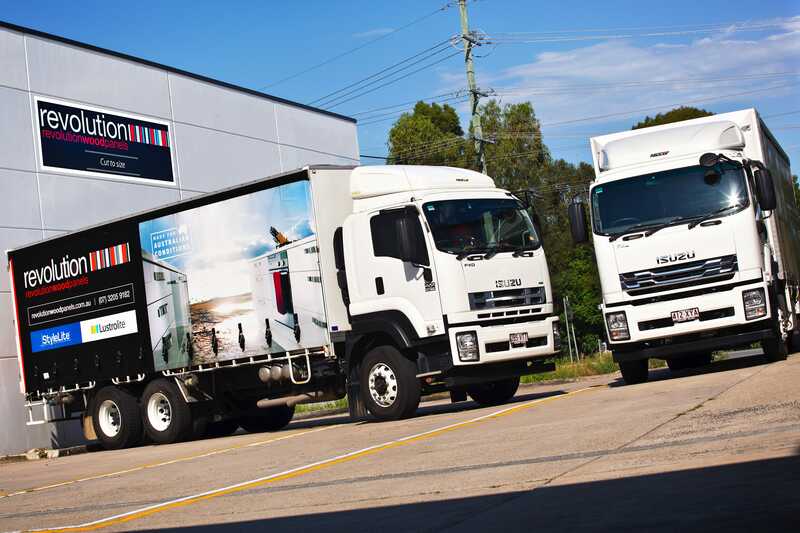 Revolution’s recent Isuzu purchase comes with a greater GVM – moving from 16,500 kg to 24,000 kg – and a few modifications of their own. “Our new Isuzu is an FXL 240-350 Long Wheel Base, with an 8.3 m curtain-sider body,” he said. “We’ve put a stand-up storage unit between the body and the cabin, and we’ve also gone to our first latch liner system. A latch liner essentially replaces the buckles that are traditionally found on a curtain-sider truck body with only a handful quick-release handles. A latch liner allows the driver to reduce the time-consuming opening and closing process of the curtain dramatically. “Normally you can have up to twenty or thirty buckles on each side, but we’ve reduced that to three latches, making loading and unloading much more efficient,” said Graham. The FXL has been out in the field for a little while now and is already delivering some telling efficiencies. It’s a particular hit with the drivers who sit behind the wheel for long stretches. “The feedback from the drivers is that it’s extremely comfortable. Revolution Wood Panelling prides itself on swimming in deep waters. From the get-go, Graham and Greg set out to create a business that could counter the deep pockets of ‘the big boys’ with industry-leading service and intelligent, strategic business decisions. Having a smart, reliable and fit for purpose transport solution has been an important piece of that puzzle. “Buying our first Isuzu was as much about having a different experience as anything else,” Graham said. 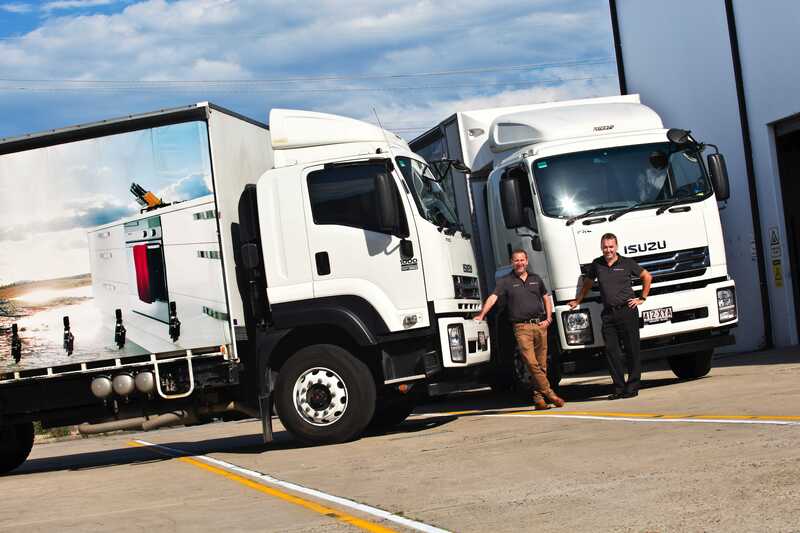 “We were looking around for a new truck and then chose the Isuzu based on the reputation. “For this latest one, we’d enjoyed the results and so stuck with what works.